In Embark’s first show of 2018, curated by Aaron Wilder, nine emerging artists reflect on the realm of the social in the digital age. Kira Dominguez. CAPTCHA: Please Type the Code, 2017. Jacquard woven. The term “THIS MESSAGE HAS NO CONTENT” originates from an error message in an email preview when the Mail App on iPhone and iPad devices does not fully download a message, or when the message only contains an image with no text. Digitally mediated communication has come to dictate the interpersonal space of our present. It is also often how we present ourselves to others. From the narcissism of the selfie to the intimacy fabricated through Skype, Facebook, Craigslist, and the like, to the manipulated language used to define our sense of reality of the world and ourselves, this exhibition seeks to explore the insatiable consumption, marketing-centric representation, and vapidly fragmented social interaction of contemporary culture. Notions of identity and representation will be flattened, pixelated, and replicated; ideas of beauty and normativity in contemporary culture will be dissected and reinterpreted; and experiences of interaction will be simultaneously decontextualized, exploited, and refreshed. This is about more than presenting anecdotes of social message transmission. It is a critical look at how communication is sent and received given the digital platforms of cultural consumption of our present. This exhibition asks viewers to consider their digital consumption to spark new ideas and dialogue on the subject of meaning via mediated social interactions. Dave Beeman (CCA) is a photographer interested in "invented communities" in the age of digital and social media and explores how our current political, economic and technological moment affects the people and forums with whom/which we relate in the real world, the amount of time we relate to them, and how committed we are to our fellow members within these communities. Lizzy Blasingame’s (SF State) screenprints react to "Society of the Spectacle" written by Guy Debord and examine our current obsession with social media. Through deconstructing and reconstructing photographs, Lizzy explores the futility of trying to live your life for the sake of documentation. 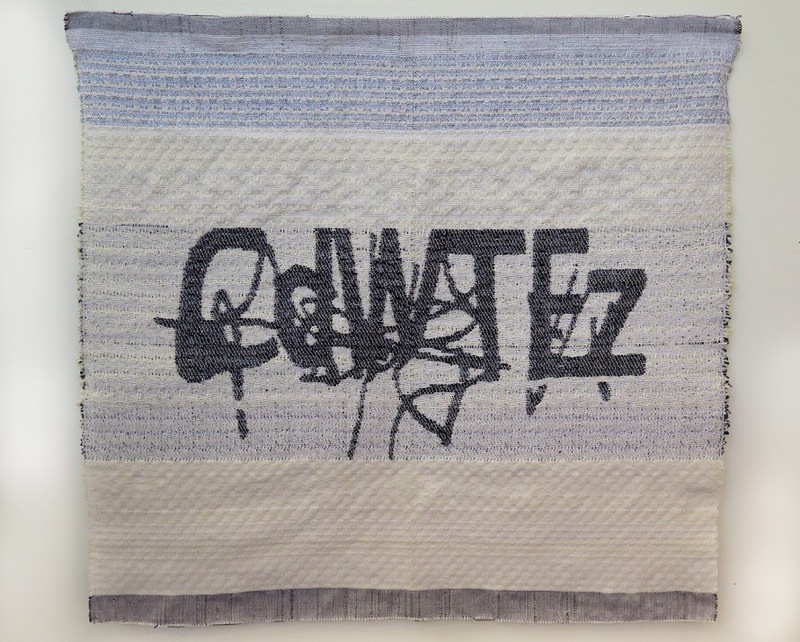 Kira Dominguez’s (CCA) weavings are about ancestral and ongoing negotiations of approximate assimilation and uses the “Completely Automated Public Turing test to tell Computers and Humans Apart” (CAPTCHA) as a puzzle through which Dominguez explores the complexity of hybrid identities. T2R/Laura Gillmore (CCA) focuses on the absurdity of our consumer society as it intersects with the digital world and how it manipulates our inner desires and personal alienations. Advertisers play with our inner fragilities and emotional value to catalyze our consumption. Gillmore uses lo-fi methods such as DIY crafting and paper-mache to build a contrast to the highly-curated and edited images that we digest everyday. Izidora LETHE’s (SFAI) work spans the disciplines of sculpture, writing, video, and drawing. LETHE’s main interest lies in extracting and tracing site specific (art) histories to examine their impacts onto our understanding of culture today. Ryan Meyer (UC Davis) presents “Social Media Suicide” where viewers are invited to interact with the artist’s Facebook profile in any manner they choose. This is one example of how Meyer seeks to explore and understand the mechanics of this continuously transforming world. tamara suarez porras (CCA) explores the ways in which we try to connect and make sense of ourselves via technology (and often fail at doing so). The works by Porras in the show focus on the faulty, vague, or glitched attempts at communication and finding information. Connie Woo (SFAI) considers herself as a physical constitution - a symbiosis, where anything contradictory co-exists within an agnostic and insoluble context. Concentrating mostly on visual arts such as images and videos, Woo constantly explores the entrance and the exit of individual spiritual continuation. Tomy Chuhe Yan (SFAI) believes emojis are more than just signs, they are a reflection of our social world, and they have multiple meanings. By looking at emojis, Yan is seeing a lot of changes in our society and how that relates to our sense of personal identity as well as our sense of otherness. Aaron Wilder is a curator and interdisciplinary artist whose work explores the introspective and social processes of contemporary culture in the way an anthropologist would analyze fragments of an ancient civilization. Wilder believes art can and should be used as a tool for generating critical thinking, dialogue, knowledge sharing, and understanding between individuals with divergent world perspectives. Embark Gallery offers exhibition opportunities to graduate students of the Fine Arts in the San Francisco Bay Area. We provide a space for an engaged community of artists, curators and scholars, and we aim to expand the audience for up and coming contemporary art. Juried exhibitions are held at our gallery in San Francisco at the Fort Mason Center for Arts & Culture. Opening Reception: Friday, February 2, 2017. 6-9pm. Hours: 12–5pm every Saturday and Sunday, February 3 - March 10, 2017.